Over their 400 million year evolution to become one of the oceans top predators, sharks have developed some truly amazing adaptations. One of the most fascinating is their ability to sense small electric fields that are emitted by other living organisms. This is known as ‘electrosense’. Ampullae of Lorenzini were named ofter the Italian scientist who described them. They are electroreceptors located predominantly around the snout and can be seen as black pores. 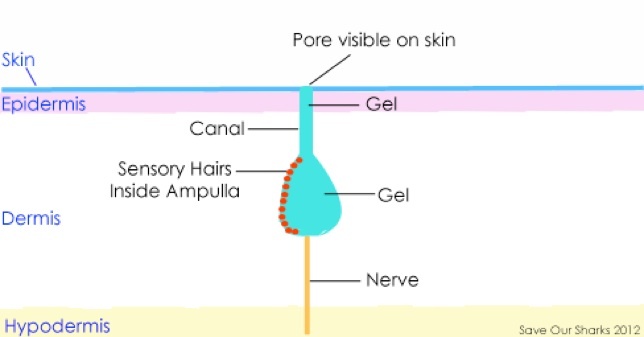 Nerve cells which ultimately connect to the brain, extend out towards the skin, where they connect to a chamber located just under the skin (the ampulla). This chamber is filled with sensory hairs and a conductive gel. From this chamber, a canal leads up to the surface of the skin - this is also filled with the conductive gel. The gel is high in potassium and has low resistance, making it ideal to conduct small electrical impulses to the nerve cell below. Although these pores are quite sensitive and can detect very small impulses, they are only useful to the shark when it is within close proximity to its prey, ie. within a few centimetres.